I’ve worked at the London Palladium many times over the years playing for different artists and in many musicals – Show Boat, Joseph, Chitty Chitty Bang Bang and Saturday Night Fever to name but a few. When a new production of Oliver opened at the Palladium in the 80’s I was asked to dep by a friend of mine who held the guitar chair. The music for this show was more contemporary than previous productions and so it made the guitar part a bit more interesting to play. There were some nicely written classical guitar lines together with electric guitar and also a guitar synth. The guitar synth was mainly used to play a bass guitar sample although it could be unreliable. Early guitar synth technology was such that however carefully I picked the string, very occasionally a note would screech out at a much higher octave and this particular part involved playing steady even quarter notes. The random screeches usually happened in the really quiet passages so it caused orchestra members and sometimes the conductor to look at me as if I’d played a wrong note even though it was due to the technology and beyond my control. Playing in a show, recording, or on live TV usually puts a musician on edge but if something goes wrong with your equipment during the performance it’s one of the most stressful things that can happen. I’ve experienced my amp popping very loudly during the quiet love scene on a show, my amp has blown 2 minutes before curtain up on another show (turned out to be the fuse) and whilst I was playing an out door concert once I looked to the side of the stage to see my guitar case on fire, I think someone had lent my case against a stage light. In the Oliver Twist story there is a character called Bill Sykes (the baddy) who owns a dog called Bullseye. 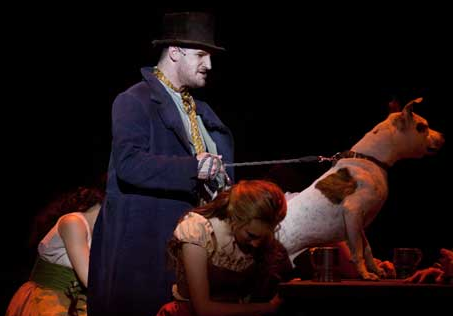 This production used real dogs during the show who were trained to run on and off stage amongst other things. These dogs had to be kennelled somewhere in the Palladium and so a vacant room was proposed by the theatre staff. When animals or children are involved in any sort of production certain officials have to be informed and strict checks carried out. I heard afterwards from one of the members of the orchestra that a representative from the RSPCA came to inspect the proposed room for the dogs and concluded that the room was not fit for them as it was a bit damp and smelt. A subsequent inspecton revealed that there was a problem with the sewerage in the toilets so a more suitable room was found for the dogs. The musicians were given their band room and it was the smelly damp room that wasn’t fit for the dogs. The sewerage was eventually sorted out some time later, but only after numerous complaints from the resident members of the orchestra and their deps. As a working musician, you very quickly learn to know your place, I think the order of importance probably goes like this, leading artists, remaining cast, animals then musicians! This entry was posted in Articles and tagged acoustic, article5, buckhurst hill, chigwell, essex, guitar, guitar lesson, guitar teacher, guitar tuition, guitarist, instrument, jazz, learn guitar, London Palladium, loughton, summer music course, woodford on June 2, 2012 by mike.